The SABR Boston Chapter Fall Meeting was held on Saturday, November 3, 2018, 32 attended the meeting, at the WBUR-FM studio, a location that has become the tradition for us at this time of year. What better way to start a meeting than to begin with an impassioned report from Dixie Tourangeau (who also provided the photos for this article) about his effort, nay, crusade, to place a plaque at the site of the South End Grounds. His battle with Northeastern University is not over until it is over — and he wins, we have no doubt he will in the end. 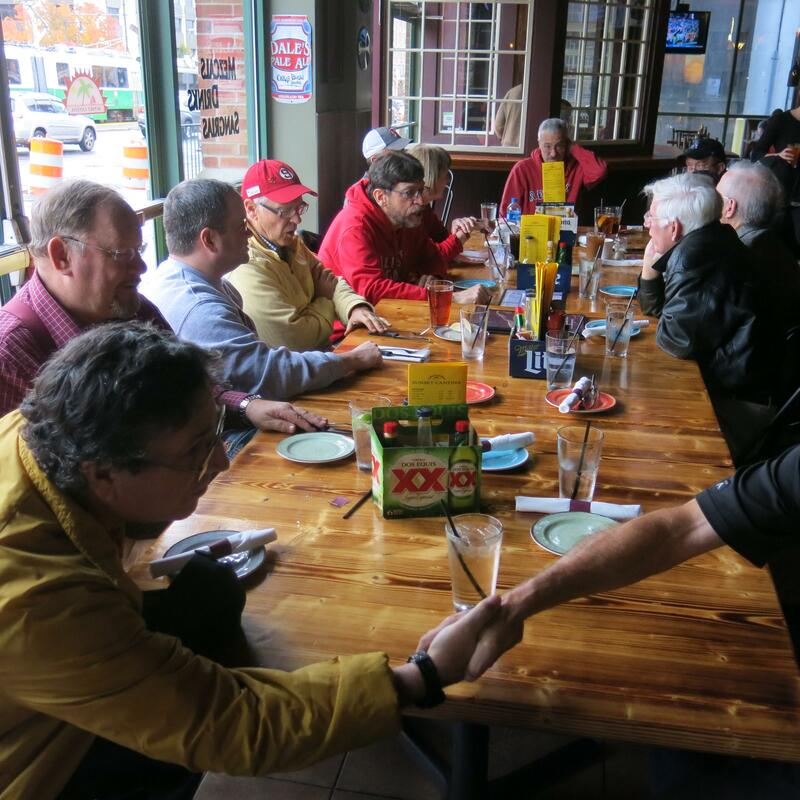 Of course, as is customary, we begin the meeting at lunch over at the Sunset Cantina. Also, we had much to celebrate at the meeting, what with the recent World Series win by the Red Sox. 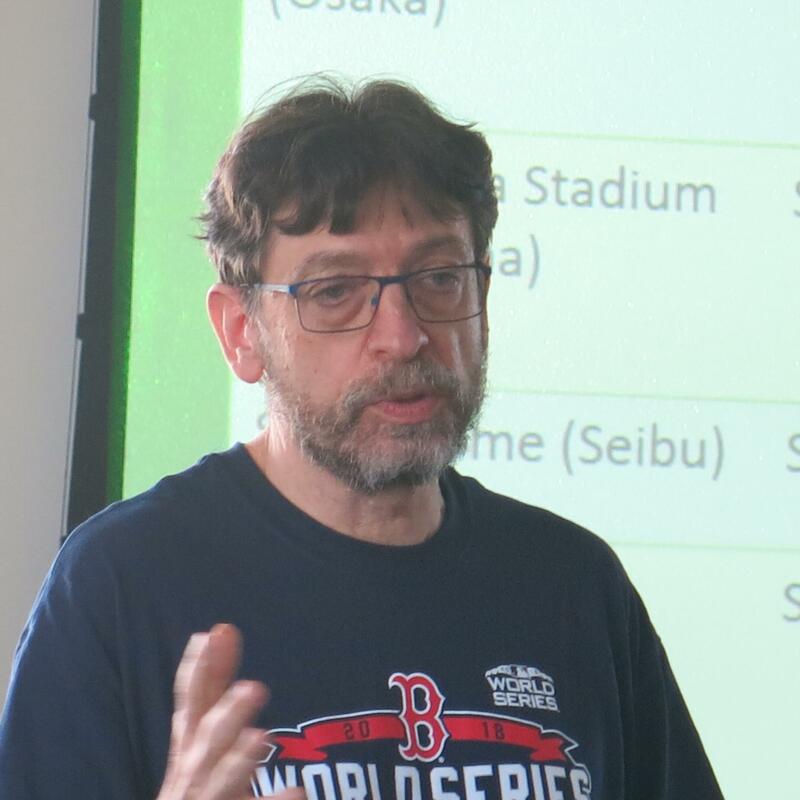 It was an honor and a pleasure to have Gordon Edes, Red Sox team historian to begin the program, and he related thrilling tales to us of the series and of the victory parade. 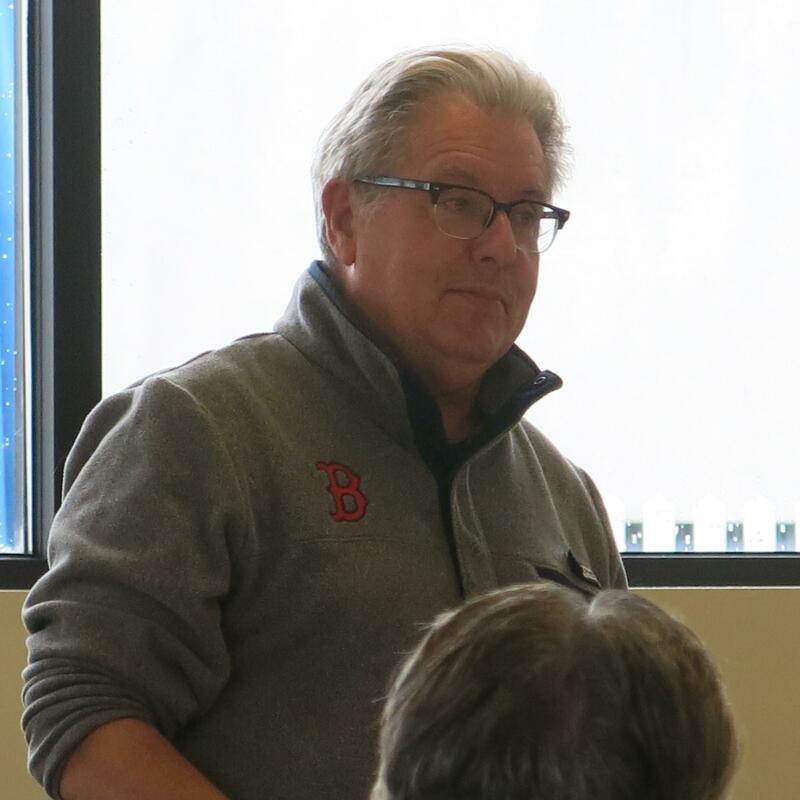 Bill Ballou, just recently retired from the Worcester T&G sports page, gave us a detailed rundown about the upcoming transfer of the Triple A Pawsox to Worcester, a subject that has thrilled one city and disappointed an entire state. Bill had the facts all spelled out, and his words will instill hope in some and perhaps closure for others. Now that Bill is relatively footloose, he will not be idle. 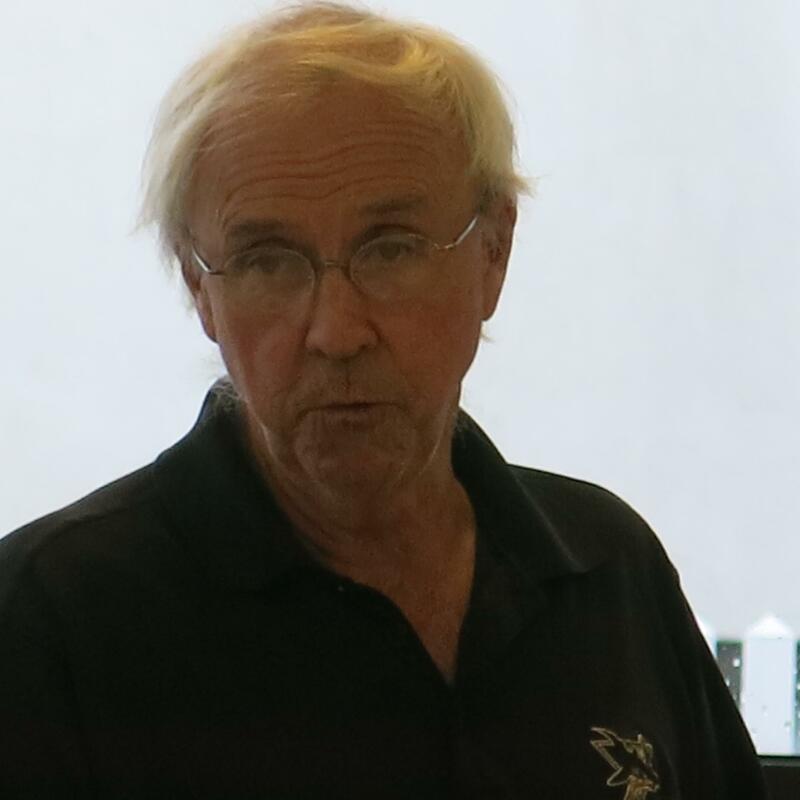 He has expressed an interest in getting the Worcester SABR Chapter back up and running, and the Boston Chapter will certainly help him do that. What the new ballpark will need is a SABR Chapter and we’ll be there to make that happen. Chapter member Mark Kanter and his wife Lynn recently toured Japan with a group of baseball enthusiasts and he returned with is stories and film. Such and interesting trip! 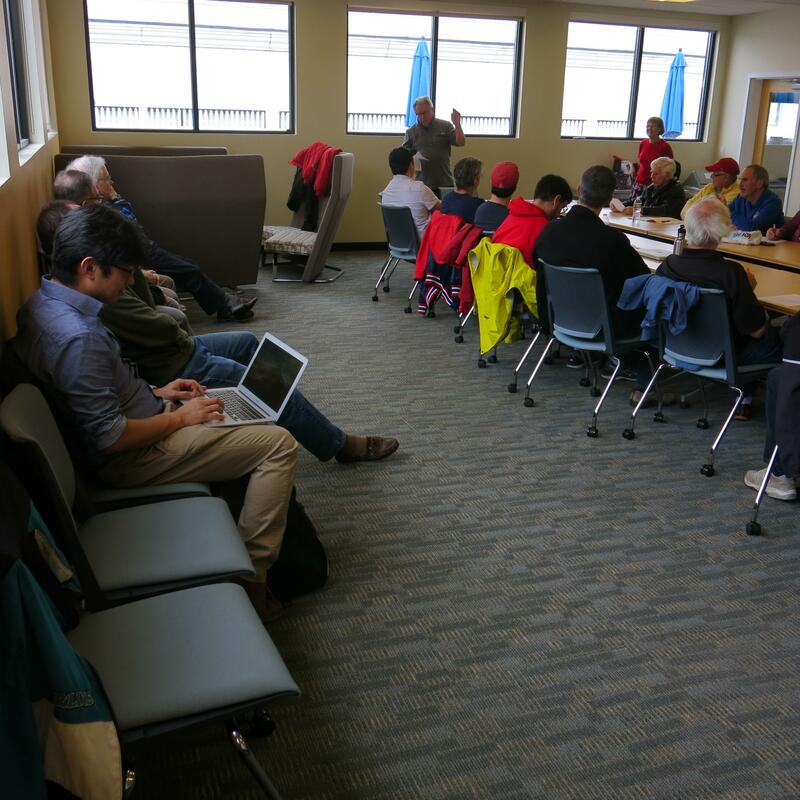 And he remarked how so few of the tour participants actually knew about SABR and what our organization offers. Mark did a bit of educating. Donna Halper is always a joy to listen to. And she also educates us about unique corners of baseball history. Her presentation this time was: — “From Reading to Listening to Watching: The Impact of Television on the Reporters, the Fans and the Players, 1948-1958.” If you were a Red Sox fan in the mid-1940s, you could read about the game, you could listen to the game, but unless you were at the park, you couldn't see the game. That changed when televised broadcasts began in the summer of 1948. 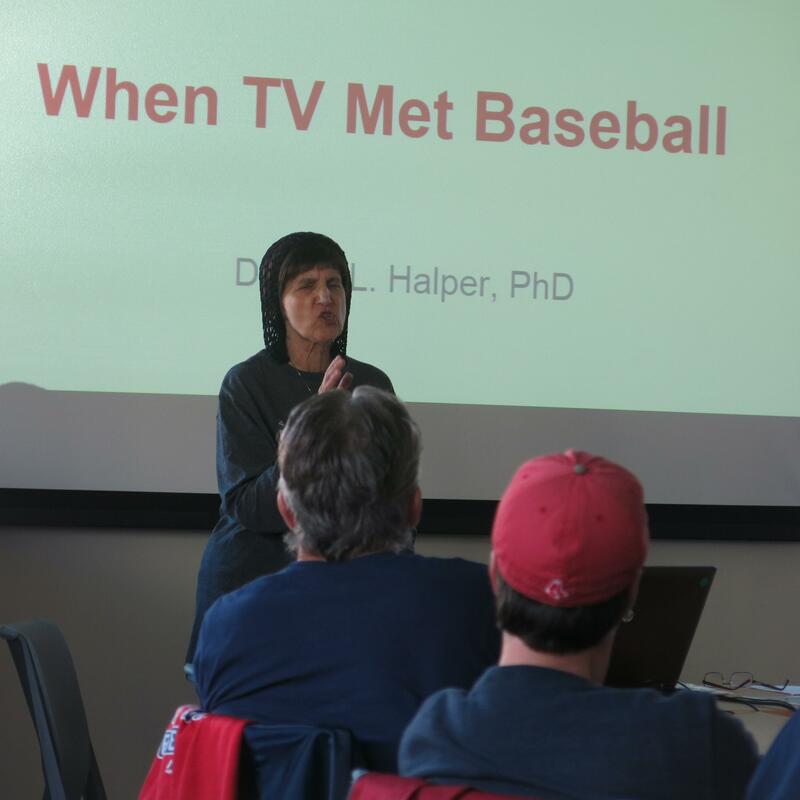 Donna Halper explored how coverage of the Sox was affected by this newest mass medium: who were the early baseball telecasters and what unique challenges did they face; how did the fans and the local businesses feel about TV; how were the players and the manager affected; did televised games cause attendance to take a nose-dive; and what did the print and radio reporters do to remain relevant in the TV era. Zach Sanzone presented his research on the Red Sox organization and race relations in Boston, especially during the years between 1945-1959. The subject of race relations is still an important issue, still dealt with today, especially the repercussions and also, how attitudes affected baseball in Boston. The effect of history is still felt today. 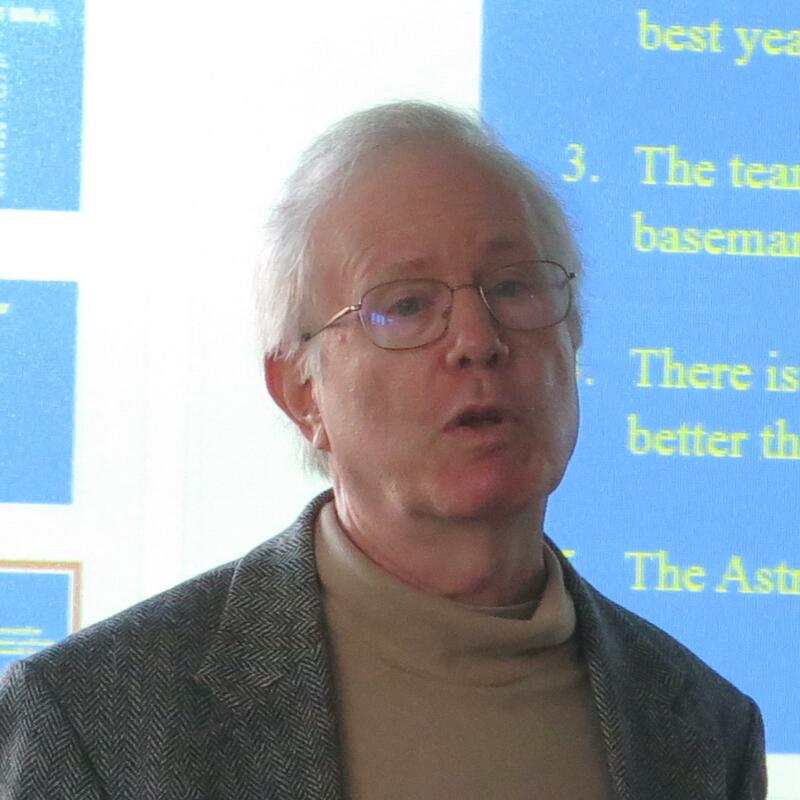 David Kaiser, the wizard of statistics, compared players over time and game, gave us his analysis of “How the Red Sox Won 10-8 Games.” If we want to bring it down to basics, we suppose it has a lot to do with Mookie and Alex — but David told us a lot more than that. David always has detailed reasoning and well-researched analysis. The Boston Chapter is working on a January program and we hope that there will be a return to Fenway Park. We are awaiting word from the powers-who-be, and once we confirm a date — we hope, SABR Day — we will send out the announcement. To contact Joanne Hulbert, email jhulbert49@gmail.com.